Augmented reality has been tapped for quite a number of functions, from chasing Pokémon Go characters to digitally visualizing furniture in a home. Now Walmart has found yet another use for augmented reality: checking product prices in its stores. I’ve been using mobile price checkers for price comparisons in stores for years, since most major retailers will match a competitor’s price if you can show them the price, which apps like ShopSavvy do in real time. The nifty twist in the Walmart AR approach is that the pricing can be seen in real time as you wave a phone from product to product. As a phone is panned around a row of products, the center product being viewed is updated, providing a digital price along with product reviews allowing a number products to be compared in real time. The Walmart AR scanner works only in iOS at the moment, since some features in ARKit were needed for the implementation, according to a company blog. The AR feature is located inside the Walmart iOS app and can be accessed by tapping the barcode scanner in the search bar and then tapping the AR icon in the navigation bar, as detailed in a Walmart video. The AR feature can be tested outside Walmart as well, by scanning a UPC code on a relevant product. The AR scan result is lightning fast and rather than showing a static page, which is typical in price checking apps, the display digitally floats in front of the product scanned. 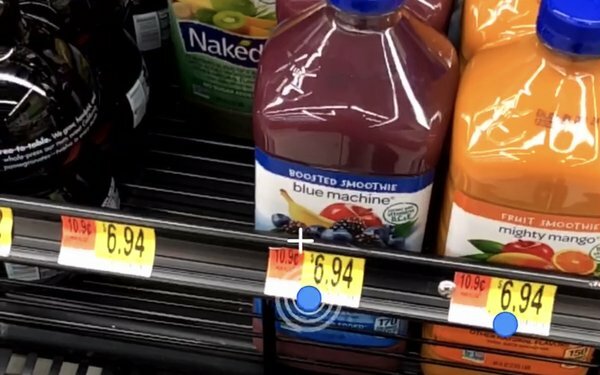 The Walmart AR Scanner is the next generation of price checking. 1 comment about "Walmart Launches AR Price Checking". Mayka Gonzalez from Neosistec, November 29, 2018 at 10:06 a.m.
First, congratulations to all the team of Walmart!, it’s brilliant and very smart, to combine a barcode reader with the use of ARKit to overcome the limitations of a barcode reading with mobile devices (especially the distance). All that you see it’s real time, and we are not using, in this case, ARKit or ARCore. You can try for yourself following the youtube video description indications. I hope this information could be helpful.